There’s a stage in life where dating transforms from fun and carefree, to stressful and frustrating. And that point of transformation is when all your friends have found love, and you haven’t. There’s a stage in life where dating transforms from fun and carefree, to stressful and frustrating. And that point of transformation is when all your friends have found love, and you haven’t. Being the last single woman in the group is hard, but it can be made better. 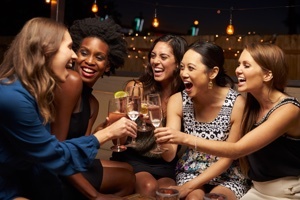 Here are some tips that will make being the last single woman in the group less depressing. The worst thing about being the last woman in the group is that everyone always has plans. Whether it’s a date night, meeting the parents, or attending a mutual friend’s birthday party, it seems that you’re always the one left without anyone to hang out with. Take the opportunity to pick up a new skill. Ever wanted to learn how to speak French or how to dance hip hop? Now’s the time. Not only will learning a new skill keep you entertained while your friends aren’t around, but it will make you a more interesting person. We probably sound like your mom, but it’s the truth. Being positive will make you more productive, happier at work, and someone that everyone wants to be around. The best thing about being positive, is that you will attract other happy people, that’s just how life works. People crave happiness, so being positive can help you attract a partner looking for the same thing. If you are just tired of the single life and feel you are ready to move onto the next stage of your life and find someone, take matters into your own hands. Join an online dating site like Zoosk or Match. Each one has millions of users, unique matchmaking features to help pair you with your life partner, and solid reputations. When times get rough and you just wish you were in a relationship, remember to pause and appreciate the single life. It’s hard, but if you think about it, being single is a gift. Take the time to travel and see the world, explore different cultures, learn about your surroundings, because you can! Your friends may all be in relationships now, but as best as you can, try to not be jealous. Your time will come, it’s just not now. Think of the possible reasons you haven’t found someone yet. Maybe you aren’t ready, maybe you still need to learn about yourself or be exposed to new things. Believe that your time will come, you just need to be patient and let life happen. The bottom line is, you don’t need to let being the last single gal in your group define you. Take the opportunity the single-life has to offer to adventure across the world, or learn a new skill. And of course, there are always the extremely popular dating apps to try to change your current relationship status.